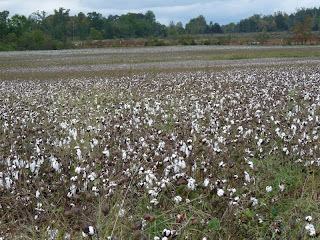 In previous visits to Alabama, I had never laid eyes on a cotton field. 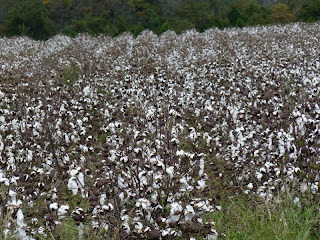 I suppose my visits were not in sync with cotton "season". The sight is one to behold. These pictures hardly do it justice. Yet, even as beautiful as the scene may appear, as intricate and perfect the plant is, as mezmerizing the field of white may be, I only associate it with one thing: The Euro-American slave trade. Of course, the closest thing to my body is cotton. The same is probably true about you. Our clothes, the sheets and blankets that we wrap around us, the towel we dry ourselves with, the swab that you clean your ears with, the gauze you attend wounds with; all these items and more are made of cotton. I'm not ignoring all the fantastic uses humans have found for cotton. I'm not even ignoring the miracle that the plant really is. I'm simply stating that when I see this cotton field, I immediately think of the United States most illustrious infatuation with it and capitalism. 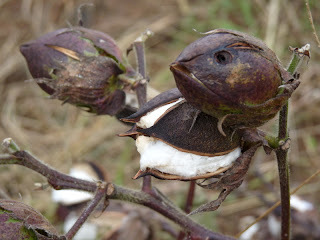 Some scholars and historians believe that the America's had its own species of cotton before the British imported cotton from Smyrna. There are accounts that point to the Aztec people being experts in the art of processing and dying cotton for clothing. The Chinese were said to use it in limited quantities. (Why would they want to use cotton when they had a monopoly on silk for quite awhile?) Also, the Persians were quite successful in cultivating cotton as well. When the British brought it to the "New World" is when cotton's ugly history began. It is fortunate for the blacks as well as the whites, that the cotton business sprang up, for the sons of Africa do not flourish in a state of freedom, and without the cultivation of the leading staple of commerce there would not have been sufficient occupation for them. A poet by the name of Preach appeared on Def Poetry Jam. He presented the poem, Cotton (Explicit). I was moved by the issues he covered in such a short period of time, in so creative a manner. A particular line that I was drawn to says, "Still we cotton-pick. Oh yes! From store racks now instead of fields..." Preach expresses his dissatisfaction with capitalism, materialism, and consumerism. 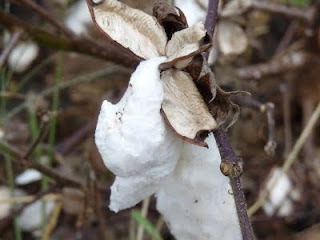 He connects the literal cotton fields of 150 years ago with the metaphorical cotton fields of today found in the chase for materialistic things. He asserts that we, as consumers of the latest trends, are making someone else richer and once again become the builders of someone else's wealth. Cotton! So simple a plant yet so miraculous in how it provides for humankind. Though I negatively associate it with the subjugation of the African family of yesteryear, I know it is a gift from God. 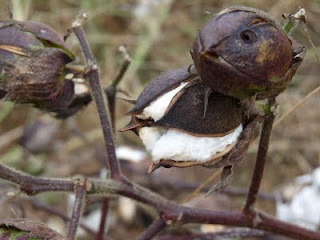 I used to pick crops (including cotton) every summer in Mississippi as a kid (37 now). I dig this post. I have to say I agree with Preach in total.